Staying in superior accommodation (4-star hotels) this walk follows paths that have linked the towns for centuries, this walking tour in Umbria takes you through the ‘Vale of Umbria’, the green heart of Italy, visiting each day some of the greatest works of the Italian Renaissance: including the Basilica of St Francis in Assisi; Pinturrichio’s masterpieces in Spello, Gozzoli and Perugino’s sumptuous frescoes in Montefalco and Filippo Lippi’s superlative frescoes in the Spoleto cathedral. On the way you will visit an enchanting hill town, perched above the Vale of Umbria, a tranquil farming town with extraordinary Roman remains; another hill town famous for its red wine and rich artistic heritage, and Spoleto, one of the most interesting towns of central Italy which, for three weeks at the end of June and beginning of July, is the seat of Italy’s most celebrated arts festivals. This a great Grade 3 walk. The walks mainly follow unsealed country roads passing through farmlands and vineyards, although there are a couple of sections where you will need to have a good sense of orientation. The walks range from 8 to 21 kilometres (3 to 6 hours). The first walk on Day 2 is probably the most challenging with a steep climb at the beginning (the views on the top of Mt Subasio are your reward) however there shorter option with less climbing is included in the notes. Day 5 walk (21 kms) can also be shortened. You are walking through one of the food and wine regions of Italy – famous for its Sagrantino red wine; ‘norcineria’ (sausages and cold cuts); lentils; truffles and…. chocolate. Generous breakfasts are included each day (you’ll need them for your walks). With notice, the hotels will be able to prepare a cut lunch for the walk. Dinners are not included in the standard however, if you select the ‘Dinners option’ (which we strongly recommend) this will include 3 course meals in some of the best restaurants in the area. The dinner option also means you’ll have a guaranteed booking each night – please contact for more information. Even without St Francis Assisi would be irresistible, a charming medieval town nestled under the forested peak of Monte Subasio. However, the monuments that have been dedicated to the saint make Assisi a highlight of any visit to Umbria. The Basilica dedicated to Saint Francis contains some of the masterpieces of Western art, including seminal works by Cimabue, Giotto, Simone Martini and the Lorenzetti brothers. 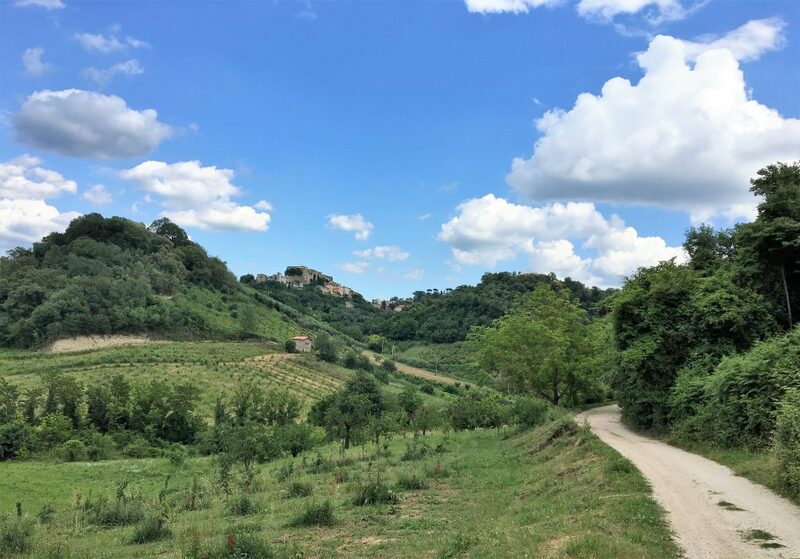 The first walk takes you up to the peak of Monte Subasio via a Franciscan hermitage, with astonishing views across Umbria to the hills of Tuscany, to a spectacular hilltop village perched on a ridge on the other side of Monte Subasio. You’ll have time to visit the 13th century church of Santa Maria Maggiore with Pinturicchio’s dazzling fresco cycle, fresh and glowing after recent restoration. (17 kms, 7 hrs). A gentle walk following country roads across the valley floor, leaving Spello via a magnificent Roman gate and passing through wheat fields to a small town on the plain, one of the hidden treasures of the region. 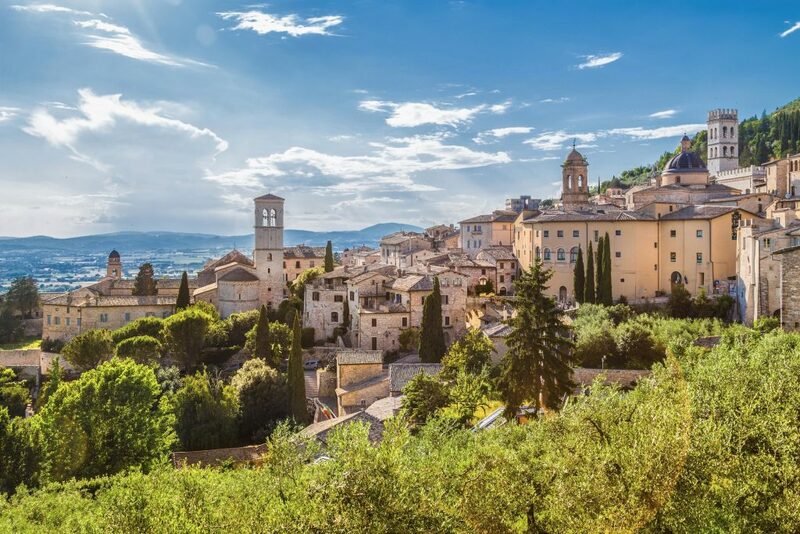 This sleepy town has two of Umbria’s finest Romanesque churches as well as impressive Roman mosaics and a delightful little 19th century theatre. (10 kms, 3 hrs). The last walk, one of the most beautiful in Umbria, winds through olive groves, around the side of the hills past a string of villages before climbing up to enter Spoleto through forests via a medieval bridge – Shelley declared Spoleto ‘the most Romantic city I ever saw’. Your accommodation is in a restored patrician palazzo 100 metres from the town’s cathedral, whose façade of restrained elegance is one of the most memorable in the region. The Duomo also contains superlative frescos by the Florentine master Fra’ Filippo Lippi, including his final masterpiece, the Coronation of the Virgin, a fitting finale to your tour! (14 kms, 4.5 hrs). After breakfast you’ll be transferred to Spoleto station, which has direct connections to Rome and Florence.